That’s why it was all the more disappointing when students showed up to hear their president uphold all the values of free speech in the face of withering media criticism—only to hear him stoop to name-calling. Then, as yesterday, we arrived more than an hour in advance. On each of our seats was a pamphlet with a brief history of the leader. I was astonished to find that, according to his biography, Musharraf “assumed the office of chief executive of Pakistan in October 1999.” There was no mention of the coup through which Musharraf seized power. Not once did Bollinger refer to the military man, who had overthrown the elected government and then refused to hold elections as promised, as a dictator—a word he seemed to have no problem using to describe Ahmadinejad. The question of how Musharraf “assumed office” was delicately avoided, a diplomatic skill that has clearly been forgotten in these two intervening years. No one seemed curious to know how Musharraf’s rhetoric about democracy fit in with his continued reign as a dictator—at least, no one with access to a mike. 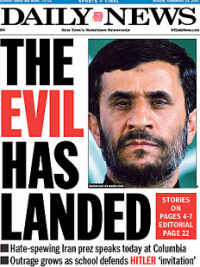 Neither Bollinger nor the press has been so forgiving of Ahmadinejad. He has been attacked in all quarters—from the front pages of New York’s daily newspapers to the sidewalks outside Columbia’s main gates to the podium where he was invited to speak. He has been called “thug,” “madman,” “tyrant,” “dictator” and more. And in this volley of words, an important opportunity was lost. This article was published on The Nation‘s website on 25 September 2007.